TEAMWORK and collaboration by employees at a Bradford technology firm have been praised by a royal visitor to the award-winning global exporter. . The Duke of York congratulated staff at Radio Design today during a tour of the factory in Salts Mill, Saltaire. He was visiting the £21 million turnover firm, which employs about 240 people locally and another 60 in India and China producing transmission technology for mobile network operators, as it received a Queen’s Award for International Trade. It won its second royal accolade in four years after doubling overseas trade over the last three years and now sells 65 per cent of its products abroad. In 2011 Radio Design won an innovation award for its innovative equipment enabling mobile network operators to share transmission masts. 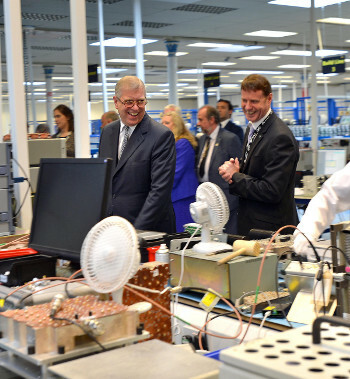 A relaxed Prince Andrew showed a keen interest in Radio Design’s product development and processes as he chatted with executives, senior engineers, technical development specialists and shop floor production staff . Company founder and managing director Eric Hawthorn said its record in the Queen’s Awards mirrored its progress, firstly as a technology innovator and then as a growing exporter. Showing the Duke around the plant he revealed that its initial innovative kit was originally dunked in the Leeds and Liverpool Canal behind the mill for 24 hours to ensure it was watertight.